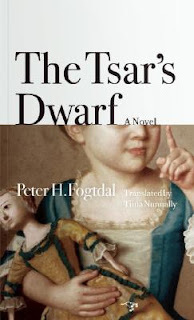 Soerine, a deformed female dwarf from Denmark, is given as a gift to Tsar Peter the Great, who is smitten by her freakishness and intellect. Against her will, the Tsar takes Soerine to St. Petersburg, where she becomes a jester in his court. There, she lives a life that both compels and repels her. Soerine eventually gives in to the attentions of Lukas, the Tsar’s favorite dwarf, and carves out an existence for herself amidst the squalor and lice-ridden world of dwarfs in the early 18th century. In this inhospitable milieu, Soerine’s intelligence and detached wit provide her some small measure of protection — until disaster strikes in the shape of a priest who wants to “save” her. I waited some time to write the review of this book because I wasn't sure if it would be a DNF or not. The author e-mailed me multiple times, assuring me that I would love it if I'd only accept a copy to review, that once I received it, I would drop all other books to read this one. That isn't exactly how it played out, but I admit that Fogtdal's gumption certainly intrigued me. So I picked the book up to read. It's a very nicely-made book. It has very bright white pages, so the text stands out and is easy to read. It has front and back flaps so that you don't need a bookmark, but can mark your page with the bookcover itself. It is also a good size- very easy to carry. The story, though, didn't catch my attention in the way I thought it would. It centers around a 17th century Danish dwarf, Sorine, who is quite cynical in her view of the world due to the horrible way she has been treated her whole life. We spend the entirety of the book (well, at least the first 120 pages that I read) in her head, which is not a very pleasant place. She is haunted by ghosts from her past and she has a pretty large chip on her shoulder. But she is still, somehow, sympathetic. I'm not really sure why I can't finish this book. But every time I picked it up to read, I tried to find something else to do instead. I would stare at the same page for minutes. I felt like the story involved a lot of people with names I couldn't pronounce and I couldn't keep them straight in my head. Also, I know very little about the history of Denmark and Russia, so the historical context was confusing for me, too. While Sorine is a compelling and interesting character, I didn't much care for anyone else in the novel. Today Kate Grenville's The Lieuetenant came for me to review from Amazon. I was absolutely blown away by her book The Secret River, so I am moving on to the next book on my list to read. The premise is very interesting and unique. I'm sorry that you didn't like it though. As you said, time to move on to the next book. The setting is one that I find interesting. Sorry to hear the book didn't work for you! I do think if you find this book's premise interesting, you might try to read it. I think it's definitely one of those books you have to be in the mood to read, and I just wasn't in the right mindset. But if you are... then it could be great! I think this sounds like a really inventive and unique book, and I am going to give it a try. I haven't read much about dwarfs in this time period, but from your description, it seems it might be a book I would have a lot of fun with. Thanks for your honesty in this review. It does sound like an interesting premise but so dark. Sometimes I just hate knowing what people are capable of.